Scott and I played a little disc golf at Morley Field this afternoon. It was quite crowded, so we had to wait at every hole. It's not a bad place to sit and wait, however. This is one of our favorite places. The jacaranda trees were still blooming with their beautiful purple flowers and the weather couldn't have been better. This is an aerial photo of Morley Field. 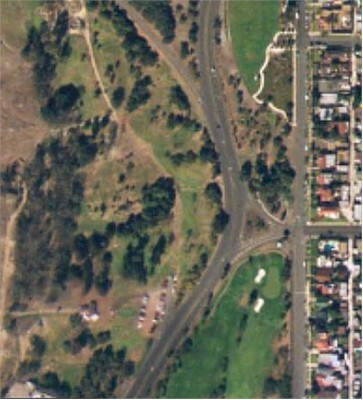 Hole 1 is just left of the parking lot in the lower center of the image. Scott shot a 69 and I shot 57. We need a bit more practice to be ready for Enman.